An individual’s memory of the Moody Blues depends entirely on their age. Although the band was formed in 1964 as a sort of Merseybeat/British R&B hybrid, copping licks from the Beatles and the Animals, they would experience a long, almost continuous evolutionary arc from then until the present day. The Moodies were directly responsible for merging classical music with pop-rock with their classic 1967 album Days of Future Passed, and they continued to explore symphonic psychedelia with albums like 1968’s In Search of the Lost Chord and the following year’s On the Threshold of A Dream. The 1970s framed the Moodies as prog-rock pioneers, focusing their high-flying muse on collections like A Question of Balance and Seventh Sojourn that would be among the most commercially successful albums of the decade. During the 1980s, the Moodies became more of a commercially-oriented pop band, cleverly incorporating classical nuances with a contemporary, synth-driven sound to score a number of hits in the MTV era. It’s the early Moodies that we’re concerned with here, however, the often overlooked and underrated R&B outfit that was formed by singer Ray Thomas and keyboardist Mike Pinder. Adding bassist Clint Warwick, drummer Graeme Edge, and guitarist Denny Laine (who would become better known in the 1970s as a member of Paul McCartney’s Wings), the band went in search of a signature sound. 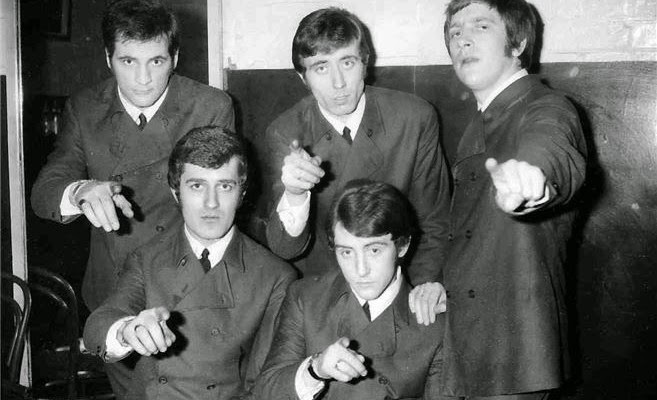 A number of singles were released, the Moodies finding the top of the U.K. charts with the hit “Go Now!,” which would subsequently lead to the full-length 1965 album, The Magnificent Moodies (released as Go Now – The Moody Blues #1 in the states). Even with the benefit of a number one single, The Magnificent Moodies failed to chart on either side of the Atlantic, the album seemingly lost in the madcap shuffle of the British Invasion. It’s a shame, too, as not only was this the only LP recorded by the original Moodies line-up, it’s also a fine collection of vintage ‘60s Mod pop. The album kicks off with the brash, cocksure R&B romp “I’ll Go Crazy,” a playful rave that, perhaps, should have been the band’s initial single instead of “Steal Your Heart Away.” With an indomitable spirit and a big band beat, “I’ll Go Crazy” is a stand-out performance that deserves wider praise. The U.K. chart-topping “Go Now!” is a classic of British pop that still finds radio airplay, the song chalk full of heartbreak and soul with whimsical instrumentation that sounds as melancholy today as it did 50 years ago. The remainder of the album displays a similar mix of lovely Merseybeat and British R&B (i.e. American blues and R&B filtered through British sensibilities). Songs like the carefully-crafted “Stop,” with its complex harmonies and minimalist (albeit effective) instrumentation, or “True Story,” a Laine/Pinder original that allows Laine to stretch out and show off some fine guitar chops, show a band still finding its way in the competitive U.K. pop scene. A cover of Sonny Boy Williamson’s “Bye Bye Bird” (penned by the great Willie Dixon) closes out the original album, the performance showing that the band had a deft hand at reinterpreting blues music for young white audiences…it’s not the Yardbirds, but it ain’t half bad, and the song would be a big hit in blues-lovin’ France. It wasn’t unusual in the mid-to-late 1960s for bands to be squeezed by their label to frequently record songs to be released every few months as singles, one-off performances that may or may not ever make an appearance on any subsequent album release. 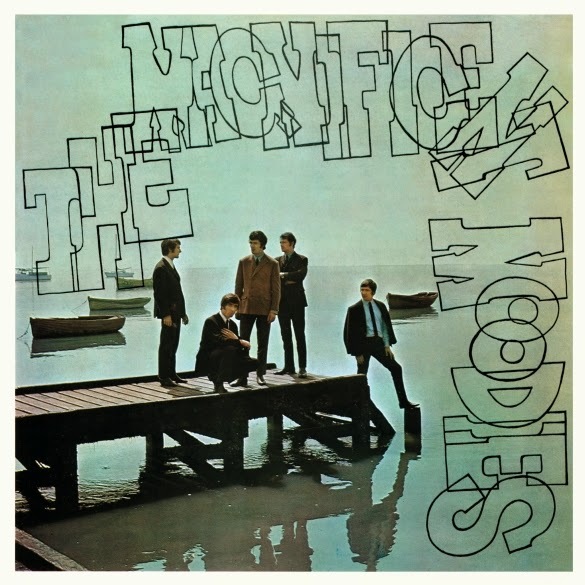 This 50th anniversary reissue of The Magnificent Moodies includes all of the band’s non-album singles released circa 1965 to ’67, leading off with their lead-off attempt, “Steal Your Heart Away.” It’s a strong song (tho’ it’s no “I’ll Go Crazy’), a sort of mid-tempo torch-song that displays spark but few flames. “I Don’t Want To Go On Without You” had the unenviable position of following “Go Now,” and it’s an entirely different sort of beast, a slow-dance number with some elegant fretwork and a somber melody that barely scratched its way to #33 on the U.K. charts (and not charting at all stateside). “From The Bottom Of My Heart (I Love You)” was the Moodies’ fourth single, an evolutionary leap for the band that brought the soul to the forefront and included a fuller, fully-realized soundtrack. The single fared somewhat better, hitting #22 in the U.K. but it’s clear that the Moodies were struggling to find an identity. Subsequent singles experienced diminishing commercial returns, tho’ “Everyday” is still pretty nifty, the single building on the full sound of its predecessor and sounding lushly cinematic in scope. The rarity “People Gotta Go” is from the French EP Boulevard de Madeleine, the song itself an exotic slice of continental pop with a syncopated rhythm and odd, but infectious melody. “Life’s Not Life,” recorded during Laine’s last session with the band, is equally engaging, the Moodies clearly evolving beyond their Merseybeat roots towards something greater, the song incorporating a more complex melody and even Thomas’s lively flute playing as the band expands its sonic palette. This expanded version of The Magnificent Moodies includes a bonus disc that’s jam-packed to the rafters with musical goodness. Seven various unreleased tracks circa 1964 to 1966 lead off, mostly alternate takes of the better songs from the original album, like a slower, funkier, less-orchestrated take on “Go Now!” which is heavier on piano but lacking the mesmerizing nature of the hit. “Steal Your Heart Away” really sizzles with slow-burning desire (better than the single version, really) while the jumpin’ jivin’ alternative take of “I’ll Go Crazy” is a step behind the perfection of the LP track. Copping the spirit, if not the melody, of “Save The Last Dance For Me,” the Moodies’ “You Better Move On” is a sheer delight, a passionate romantic ballad that sounds and feels like a 1950s-era doo-wop classic. As was pretty much required during the era, the band made several appearances on the BBC Radio program Saturday Club, and The Magnificent Moodies includes material culled from a handful of those promotional broadcast sessions. The ubiquitous “Go Now!” makes another appearance here, the radio performance sounding better and more wistful than the studio version, and the ethereal take on “From The Bottom Of My Heart (I Love You)” clearly displays a glimpse of the band’s future musical direction with its textured arrangement. A cover of Rufus Thomas’s “Jump Back” is a trifle – but a rockin’ trifle it is – relying on a Bo Diddley rhythm and harmony vocals to lend a sense of energy and motion to the song. A brief interview with Ray Thomas and Graeme Edge leads into “You Don’t (All The Time),” the song a B-side to the “Everyday” single, a swaggering performance displaying more than a few shades of Beatles influence. Amidst constant touring and promotional appearances, the Moodies returned to the studio in August and September 1966 to begin work on a follow-up to The Magnificent Moodies. Working again with producer Denny Cordell, these 1966 sessions resulted in a number of songs that, for whatever reasons, remained unreleased until now. There are several good tunes here, too, foremost being “This Is My House (But Nobody Calls),” a lively slice of period pop-rock written by Laine and Pinder. Offered here in mono and stereo alternate takes (the stereo mix sounding stronger), the song had enough Mod undertones to tie in with the band’s previous work, but with a more sophisticated musical arrangement. Released as a single in 1966, “This Is My House” sank like a stone. Although psychedelic influences had yet to hit the world of rock ‘n’ roll full-blast, “We’re Broken” certainly enfolds an acid-rock vibe with its full instrumentation, urgent vocals, crashing cymbals, and delicious harmonies, while “I Really Haven’t Got The Time” has one foot in the dancehall R&B of the band’s recent past with flailing piano and fleet-footed harmonies. This isn’t the Moody Blues as you might know them, The Magnificent Moodies standing separate but equal to every note of music that would follow from the band. The Moody’s lack of chart success after 1965 lead to Warwick leaving the band (replaced, briefly, by Rod Clark); the bassist’s departure was followed shortly by Denny Laine’s resignation. The band had to regroup out of necessity, bringing on new guitarist Justin Hayward and bassist John Lodge, abandoning their R&B sound and reliance on cover tunes to embrace new sounds and to begin writing their own material. Beginning with the gradual success of Days of Future Passed, the Moodies enjoyed a string of a dozen commercially successful releases, all of which yielded hit singles and high chart positions, achieving Gold™ and Platinum™ sales status in the U.S. It all began with The Magnificent Moodies, though, and this deluxe box set is a “must have” not only for Moody Blues fans, but for Merseybeat and British Invasion collectors as well. There’s a lot to digest here – a total of 56 songs on two discs, half of them previously unreleased, most of them recorded in mono, and all re-mastered from the original first generation master tapes. Accompanied by an illustrated booklet with rare photos and a lengthy, informative essay by writer Mark Powell, the deluxe set also includes three promotional postcards and a cool double-sided poster. For those who only want a taste, there’s also a single-disc version of The Magnificent Moodies available that includes the original dozen album tracks and all the band’s singles (essentially disc one of the deluxe set).